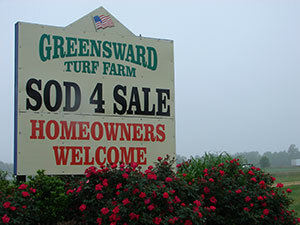 Greensward Turf Farm, Inc. is a 45 year old family owned and operated sod turf farm located in the Washington DC Southern Maryland area of Waldorf MD. We supply residential homeowners, landscapers, landscape contractors, developers,builders, contractors with turf sod for all their landscaping and landscaping design projects. 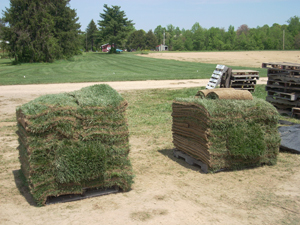 A family operated business allows controlling all the aspects of running a sod turfgrass farm. Our owners, David Hamilton Sr. and David “Skip” Hamilton, Jr., began the business in 1968. 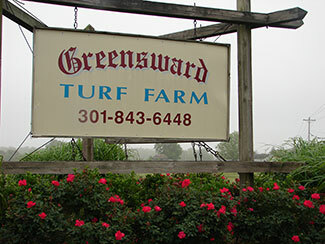 Since then we have helped homeowners and commercial business owners and landscapers with turf sod for over four decades in the Washington DC Southern Maryland area of Waldorf MD as well as Charles County, St. Mary’s County, Calvert County, Northern Virginia, Alexandria VA, King George VA, and these communities as well: La Plata, Waldorf, White Plains, Hughesville, Bryans Road, Indian Head and Saint Charles MD. Please Note: We Do Not Sell Zoysia Grass. Click here for a quick quote if you know your sod square footage. To calculate it, Click here. Why Should We Sod Lawns? Installing sod is less work since you are installing a mature lawn immediately instead of growing one over years of time. Sod can be installed almost anywhere to stop soil erosion and water pollution on steep grades where rain would wash away seed and soil or where seeding is impracticable or too costly. 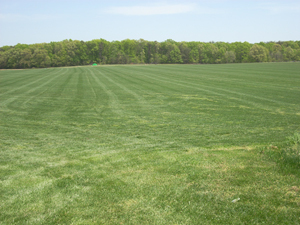 Sod is available in a variety of grass blends including Kentucky Bluegrass and Turf Type Tall Fescue that Greensward Turf Farm supplies to suit various needs such as climate, amount of usage, sun and shade conditions. Sod can withstand heavy usage. Within a couple of weeks, it is ready for lawn games, family outdoor living, parks, golf courses, athletic fields, as well as residential homes and business parks. A turfgrass sod lawn can be installed year round. 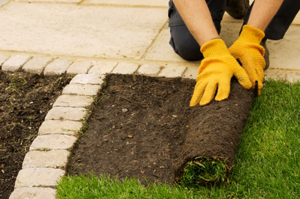 Sod is a great investment in your home or business, increasing curb appeal and value. Sod is a Green environmentally friendly product which reflects the sun's heat, absorbs noises, carbon dioxide & other harmful pollutants and releases valuable oxygen & moisture into the air we breathe. Sod lawns meet the needs of our “we need it yesterday” mentality as it is able to be installed in hours, at a shockingly low cost. How much Sod will I need? 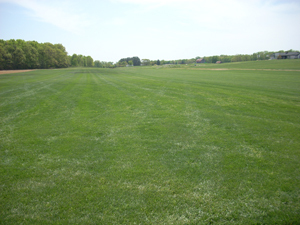 To determine how much sod is needed, you will need to find out the length and width of the area you need sodded. With a tape measure, determine the area of your planned lawn by measuring to get your length and width. Multiply the length by the width to get square foot area. Sketch this out on a piece of paper and bring it to us. 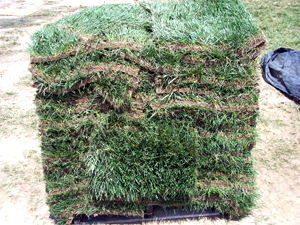 ** You should always round up your requirement about 10% to make sure you order enough sod. When you have the square footage calculated, give us a call or Click Here. Rototill the area to a depth of 4 to 6 inches, having the soil slope away from foundations, etc. Have your lawn soil tested to determine how much fertilizer, lime, peat or compost, is needed to a depth of 3 to 4 inches. Remove rocks, roots, and large clods. With a lawn roller one third full of water, roll the area lightly to firm the soil surface and expose low areas that need more soil. Keep the grade 1 inch below sidewalks or driveway. Moisten the prepared area to provide a wet base for turf to a depth of 6 inches recommended for most soils. Install your turf sod as soon as possible and water within 30 minutes of installation since Turf is a live plant requiring ground contact and moisture to survive. Place stacks of unlaid turf sod inthe shade in warm or hot weather protecting it with moist burlap sacking or sprinkling. Install turf edges and ends against each other tightly, without stretching along a driveway or sidewalk or the longest straight line. Stagger the joints while avoiding gaps or overlaps in each row in a brick-like fashion. Do not leave small strips at outer edges since they will not hold moisture. Turf pieces should be placed across the slope in a sloping soil situation. Avoid repeated walking or kneeling on the turf during installation or just after watering to prevent indentations or pockets of air. Roll the entire area to improve turf and soil contact and remove air pockets after installation. Water your turf within one half hour of installation and then daily or more often for two weeks keeping the turf moist until firmly rooted. Then less frequent and deeper watering should begin. The weather will determine how much you need to water but make sure you water enough to survive hot dry or windy periods. Turf near buildings will need more watering since they will reflect heat, thusdrying the turf. Avoid heavy or concentrated use of your new lawn the first three weeks so the roots can firmly knit with the soil, insuring that the turf will remain smooth. Mow your lawn often but only remove one third of the grass and keep your mower blade sharp. Depending on climate, sod type, soil, insects, weed and disease conditions fertilizer and chemical applications will vary. Your home or business property value will increase considerably with a properlymaintained new sod lawn providing beauty, a clean playing surface, and an enhanced environment. 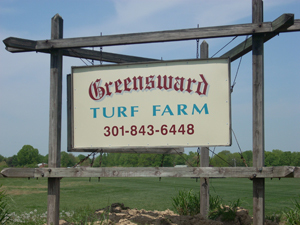 Whether you are a homeowner, commercial business, landscape contractor, developer or builder, and if you need sod and know the square footage needed, give Greensward Turf Farm a call today at 301-843-6448, or Click Here. We offer forklift delivery of our sod!